As ambitious lawyers, we strive to do just that: to make a difference someday, somehow, in the lives of our neighbors and communities. 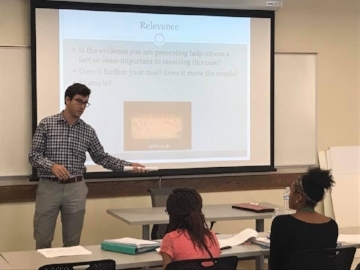 This summer two of our associates had the pleasure of educating the young minds of aspiring law professionals at Ohio University’s Summer Law & Trial Institute (SLTI). This 12-day immersive program aims to engage and challenge high school juniors and seniors in the field of Ohio law. This highly competitive program seeks to create the next generation of legal, advocacy and community experts by exposing these students to the criminal justice system through academic study and hands-on learning. Dagger Law associates Alyssa Parrott and Brian Kelso gave their time to teach students about the justice system firsthand. 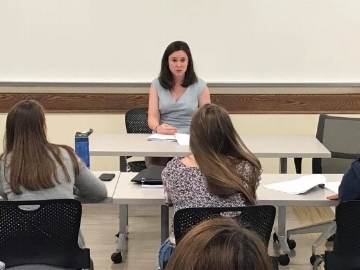 Parrott taught the Juvenile Law class at SLTI; her experience practicing as an attorney to juveniles in delinquency, truancy, unruly and abuse, neglect and dependency cases helped enlighten the students as to how the law applies to minors. Brian’s experience in civil and criminal litigation helped shed light on his Intro to Evidence class. As a regular volunteer at the Southeastern Ohio Legal Services (SEOLS) pro bono clinic, he was able to incorporate real life legal examples into his lecture. “Because we are a law firm that is rooted in the community this program was the perfect opportunity to involve ourselves in educating the young legal minds of tomorrow,” said Brian. Alyssa Parrott, a graduate of Ohio University, felt her world had come full circle teaching in the classroom where she had once sat as a student. Dagger Law shares a belief that citizen involvement plays a key role in the continued growth of our community. If you are looking for a local attorney for a group event or educational opportunity, please contact us at us at 740.653.6464.